Monday saw rain and a chill to the air as February hasn’t let us forget about winter just yet. This morning we finished our bow stem and the rest of our chine laminates. Once all of these pieces were fit, we mixed up some epoxy and set them all in place. 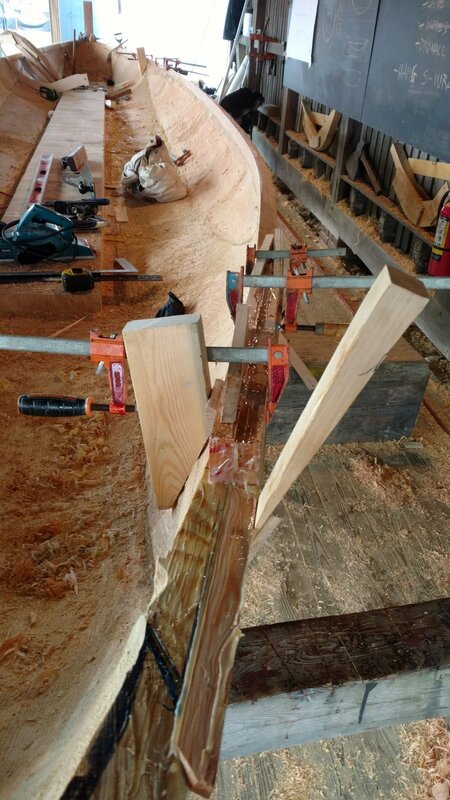 This afternoon we worked on the next couple of temporary frames for the interior of the hull that will help us fit our sheer planking onto the log portion of the hull. Tomorrow we will get these frames in place and work on scarfing together our red cedar. After fitting the scarfed pieces together and gluing by tomorrow afternoon we will glue on our sheer planking on Wednesday and Thursday.